Part of regular finch maintenance is clipping the toenails or "claws" as needed. Some species are normally prone to overgrown nails (munias and mannikins, for instance) while other finches suffer from overgrown nails only when they have an underlying health, husbandry, or nutritional problem. Healthy zebra finches, for example, rarely need their nails trimmed. Overgrown nails can be a danger to a captive finch. Long nails are more prone to getting caught in nests, nesting material, cage bars, and other cage accessories. If a nail gets snagged, the finch can become injured while struggling to get free (it is possible for a bird to rip off the nail or even break its leg in the process). Overgrown nails can also predispose to other health problems like pododermatitis (bumblefoot). When a finch is standing on the ground, the tip of the nail should be on the same plane as the toe. Nails which cause the toe to lift off the ground when a finch is standing are considered too long and require trimming. Grossly overgrown nails may begin to grow in abnormal directions, and will often begin to curl around. Below are some pictures of strawberry finches with overgrown nails, some of which are curling. Compare these photos to those of normal nails (also provided below). Hold the finch in your non-dominant hand (if you are right handed, your left hand is your non-dominant hand). While cupping the bird's wings and back in your palm, place the finch's neck between your index and middle fingers. Now use your dominant hand to grasp one of the legs (grasp above the foot, never pull on the toes!) and extend one of the feet outwards so that you can secure the bird's "ankle" between the thumb and ring finger of your non-dominant hand. This holding technique should allow you to restrain the bird in such a way that it cannot escape while not holding it so tightly that it cannot breathe. Hold each nail up to a light (if necessary) and try to locate the blood vessel which runs through it. When clipping the nail shorter, do your best to avoid nicking this blood vessel (called the "quick"). 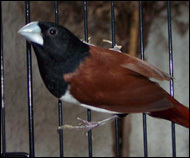 In finches with horn colored nails, the quick can usually be visualized; in finches with dark nails, however, it may not be possible to visualize the quick. If you have a finch with dark nails, only snip a small amount off the nail at a time. The quick should recede over time as the nails are regularly trimmed to an appropriate length. 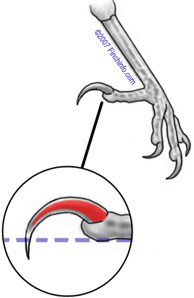 Ideally, nails should be trimmed so that the finch can comfortably stand on a flat surface with the tip of the nail being on the same plane as the toe (this is represented by the dotted line in the diagram). If the quick is so long that it passes this dotted guide line, it is safer to leave the nail a little long, taking just a little length off the tip of the nail, and avoiding the quick. If the quick is accidentally cut, the nail will bleed, sometimes profusely. Finches cannot afford to lose much blood due to their small body size and small blood volume, so act quickly to stop any bleeding that may take place. Bleeding can be stopped by dipping or pressing the bleeding nail tip into a small amount of styptic powder (e.g. "Kwik-stopTM"), flour, or cornstarch. If the powder does not adhere to the nail, you will need to cauterize the nail with heat or silver nitrate (do not get silver nitrate on your skin or anywhere else on the bird or it will burn). The easiest way I have found to cauterize the nail (using heat) is to light a match, blow it out, and quickly touch the head of the match to the tip of the bleeding nail. When doing this, be careful not to touch the match to the skin or feathers of the bird. Remember to wash your hands and sterilize the nail clippers between birds. This helps prevent the spread of any illness. Sterilization can be achieved by dipping the blades of the nail clipper in rubbing alcohol for 10 seconds and then carefully running the blades through a small flame (match or lit candle) until the alcohol burns off. Obviously be careful not to burn yourself or anything other than the blades of the nail clippers. Allow the clippers to cool and wipe off any soot before using them on the next bird. Hold the bird in your non-dominant hand. The bird's back and wings should be cupped in the palm of your hand. Maneuver your fingers so that the bird's neck is restrained between your index and middle finger; this leaves the thumb free. Use your other hand to carefully hold one foot extended so that you can grasp the lower leg between your thumb and finger. You should always hold the foot above the toes and never grab or pull on the toes themselves. You can secure the foot between your thumb and middle finger. If this hold does not feel comfortable for your or if you do not feel you have a secure enough hold on the bird, you can alternatively grasp the foot between your thumb and ring finger. Once you have a good hold on the bird's foot, you will need to decide how short to cut each nail. First, try to locate the small blood vessel called the "quick" which runs through each nail. A bright light source illuminating the nail may help. If possible, avoid cutting this blood vessel, and instead, cut just beyond it. Ideally, the nail should be cut so that if the bird was standing on a flat surface, the tip of the nail would be on the same plane as the toe. If the quick is very long, however, it is preferable to leave the nail a little long and cut just beyond the quick. You may use specialty bird nail clippers or a small pair of toenail clippers. Turning the clippers sideways helps to ensure that only one toe nail is clipped at a time. When grasping the nail with the clippers, be careful not to include the neighboring toe between the blades. When you are sure you are in the right spot, and that you only have the nail between the clipper blades, cut the nail. Repeat this process for all toenails on the foot. Notice how each nail is clipped to a length where it would intersect a line drawn adjacent and parallel to the toe. Remember to inspect the bottom of the foot for any evidence of bumblefoot or pododermatitis. The bottom or plantar surface of the foot should have a soft cobblestone appearance. Any spot which is flat and shiny, discolored, swollen, red, or bleeding is considered abnormal. After inspecting the foot, use your dominant hand to hold the other foot extended while you grasp it between your thumb and finger. Remember again not to pull on the toes while maneuvering the foot. As you repeat the process of clipping each nail, be careful not to cut the nail too short. If you do accidentally cut into the quick and the nail begins to bleed, you can stop the bleeding with application of a small amount of styptic powder. If you do not have styptic powder on hand, corn starch or flour may be substituted. If this does not stop the bleeding, consider cauterizing the nail with heat. When I need to cauterize a nail, I light a match, blow it out, and quickly touch the head of the match to the bleeding nail tip, being careful not to touch the match to the skin of the toe. Again, before releasing the foot, be sure to inspect the bottom of it. While you have the bird captured and in your hand, it is a good idea to quickly give the bird a once-over to check for any evidence of illness. Feel along the breast or keel; this should not feel too bony nor should it feel too plump. Also check the bird's eyes and nostrils for any evidence of discharge, swelling, or other abnormality. Make sure the beak is smooth, symmetrical and not overgrown.